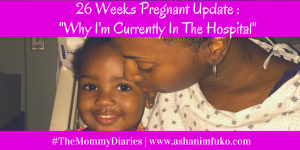 I recently shared with you guys in this post, that I was admitted to the hospital a couple of weeks ago, due to my water breaking, right before I turned 26 weeks pregnant. Well, that was just the beginning of another set of surprising events that were about to take place. 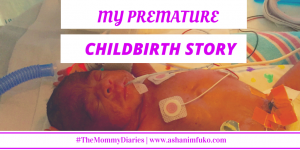 Last Tuesday (July 7, 2015), I started having serious contractions, and due to the position of the baby, and my water having already been broken, I ended up having a c-section Thursday afternoon, the day before my daughter would turn 28 weeks old. Dalila Johari Mfuko was born on July 9th at 3:29 pm at around 27 weeks old. She weighs 2 lbs. 8 oz. She cried when she came out, which is a great sign! She is doing very well. I am currently out of recovery and back in a room in the postpartum unit of the hospital. 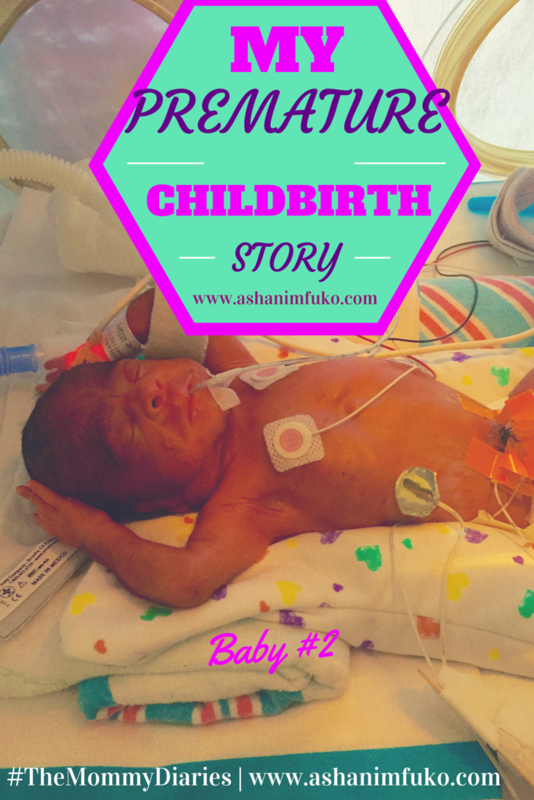 I am doing very well, and have hit all the milestones my doctors wanted me to reach postpartum. So I will actually be getting discharged tomorrow. Dalila is a preemie, and in the NICU, so I didn’t actually get to see her in person until about about 24 hours after she was born. But hubby took a few pictures for me, while I was in post-surgery recovery, and I was able to get a sneak peek of her. Dalila is a Swahili name, pronounced, da – LY – la. It means gentle, her soul is tender. Johari, also a Swahili name, pronounced jo – HAR – ee, means, a gem, something of value. We love to honor my husband’s African heritage, in the names of our daughters. The first time I saw her, I was blown away! I couldn’t believe how tiny she was! I had never seen a baby so tiny before in real life, only on television. But the NICU nurses say that she is actually on the larger side, for a baby of her age. 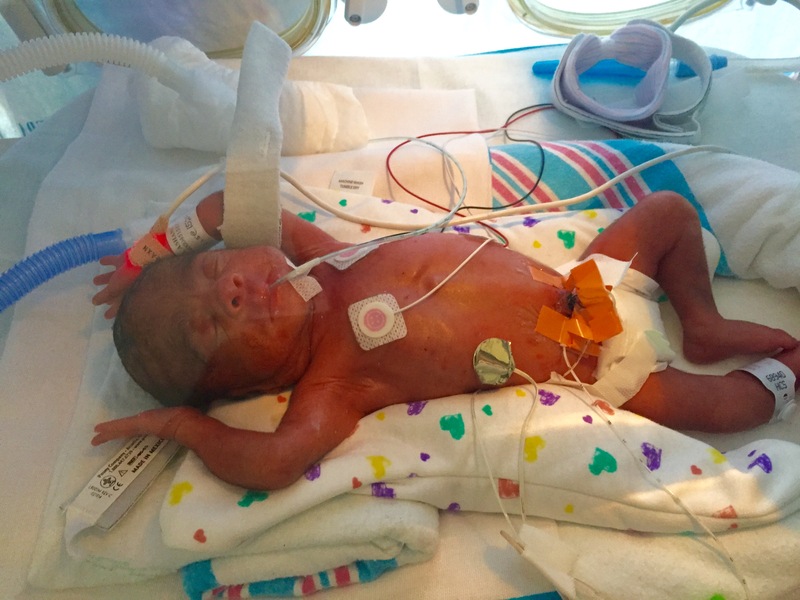 Many babies born as preemies weigh just a little over 1 pound. So the fact that she’s 2 lbs. 8 ounces, is pretty incredible. She is truly a fighter, and has gotten the nickname, “the feisty one” in the NICU lol. 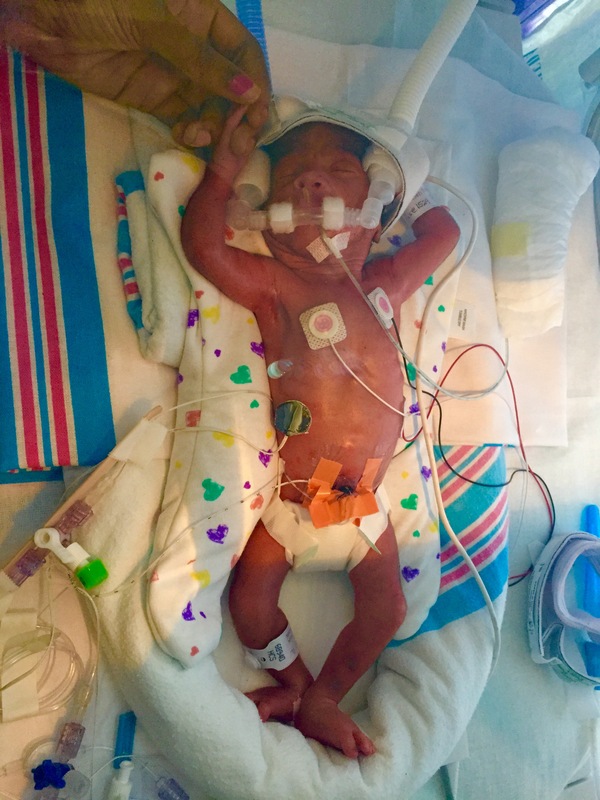 She is strong, and has been breathing on her own (no help from a ventilator, or additional oxygen necessary), from day one, and her vital signs are very strong as well. I have been pumping my breast milk, and building up my supply, and they have started giving her small, breast milk feedings through a tube for now. As she tolerates the feedings more and more, grows, and gets stronger, they’ll eventually start giving her my breast milk in a bottle. Then down the line, I’ll be able to breastfeed her directly. But that won’t be for a while. She will more than likely be in the NICU for about the next 2 months, give or take, depending on her progress. I will be coming to the hospital every day to be with her, and also bring more breast milk for them to freeze. I haven’t been able to do skin-to-skin contact with her just yet, because she has a couple of catheters in, an intravenous line, along with a C-PAP. But her doctor and nurse said that I should be able to hold her for the first time, in about a week or so. I can’t wait for that moment!! I’m super excited about being discharged from the hospital tomorrow, and finally going home, after being here for 2 1/2 weeks. I mean, I can’t believe that I have not been outside, for almost 3 weeks, that is just CRAZY!! However, I’m very sad at the idea of leaving my little baby here at the hospital, and being more than an elevator ride away from her. I’m also a little sad to be leaving the care of my awesome doctors and nurses. They’ve taken such great care of me over the past couple of weeks, and been so wonderful! Knowing that they won’t be at home to take care of me, makes me a little sad. But I have an amazing support system, and so many family and friends that love me, I know that I will be taken care of, as I recover from surgery at home. With God on my side, along with my wonderful hubby, my mom, our babysitter (one of my former Joffrey Ballet School students, who rocks! ), my postpartum Doula, my family, and friends, I’m sure that this next phase of life will be very manageable, and fly by. Then, before you know it, Dalila will be coming home to be with us! Oh, I cannot wait for that day!! Praise God that we are both doing very well!! Thank you everyone for your prayers and well wishes! If you have any experience with preemies, or even pre-term babies, I’d love to hear your story. This is all new territory for me, so I love to hear stories from other moms and parents, who have gone through a similar experience. Please leave me a comment below! If you follow me on Facebook, Instagram, or Twitter, then you already know that I was admitted to the hospital this past week. 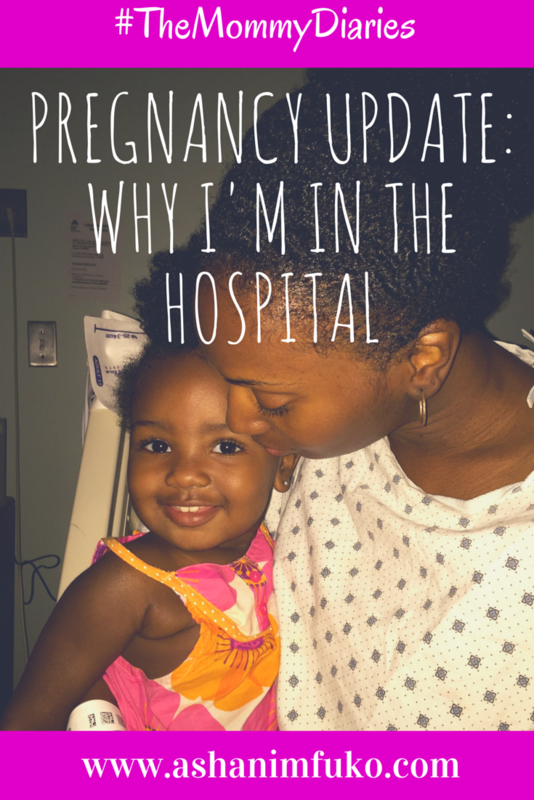 But you may not know the details of why I’m currently in the hospital, or what happened. So I wanted to share my experience with you today, and let you know what’s really going on. On Wednesday morning around 7 am, my water broke. I am only 26 weeks pregnant. So its really too early to give birth. I’m about 11 weeks away from full-term pregnancy. My hubby Fredy, my 19-month old daughter Zuri, and I went to the hospital immediately, and after seeing the doctor, I was admitted to the hospital. Our baby girl is fine, healthy, has a strong heartbeat, and everything. I feel fine as well, perfectly normal actually. When this happens, they monitor you closely over the next 24 hours, because its possible that you can go into early labor. Thank God that I did not go into early labor, and therefore was able to be moved up to the anti-partum unit of the hospital, where I will have to stay until she is born. In these situations, they will induce labor at 34 weeks. So I will be in the hospital for the next two months. And when the baby is born, hopefully at 34 weeks, there’s a good chance that she will have to be in the NICU (neonatal intensive care unit) for a few weeks. At this point, the goal is to keep me pregnant, and the baby inside of me, for as long as possible, for her optimal health and safety. So far, she is very active, happy, and comfy in my belly, so we feel strongly that she will stay that way. She has a very strong heartbeat, and is doing great! I would say that the hardest part of all of this so far has been being away from my daughter, and not being able to take care of her every day, like I normally do. That’s been the most challenging part out of everything. But I am blessed to have an incredible husband, who is a wonderful father to our daughter! Plus, our family and close friends are just truly some of the most amazing, loving, supportive people a girl could ever ask for. So they are all helping to make this transition and challenging experience, much more manageable. Thankfully too, hubby brings Zuri to the hospital for long visits with mommy every day, which she seems to be enjoying a lot, so that makes me very happy! Fredy and I will definitely need your help, support, encouragement, and lots of prayer! I don’t understand why all of this is happening in this way, at this time, but I trust God, and I know that He is faithful. I am staying positive, because I know things could be so much worse. We were supposed to be flying out to Florida on Thursday morning for vacation, and then to the Bahamas in 2 weeks for another vacation, none of which will be happening now, of course. I thank God that this didn’t happen while we were in another state or country. To God be the glory! The truth is, I need to rest and be taken care of during the last months of my pregnancy, and this is probably the only way that that would’ve happened. Had I been home with my daughter every day, and doing my normal routine, I certainly wouldn’t have given my body the rest and care that it truly needs for this pregnancy. I’m getting ready to start a FANTASTIC new consulting gig, as the Social Media Strategist and Digital Marketing Specialist, for the world-famous, iconic dancewear brand, Bloch Dance USA! What a blessing that I will be able to do the work that I love, from the hospital, and not have any distractions. Focusing on such an exciting, major project will definitely help to keep me sane while I’m in here, and it’s safe for me to do, since I’m on bed rest. My doctors and nurses think that it’s fantastic that I’ll be able to work from my hospital bed, and stay sharp, energized, and connected to my normal, professional life, in such a great way. Yay for wi-fi, and my Macbook Pro! God is good!! It feels great to be in a position and in a place where I will be able to meditate more, and really listen to, and hear what God is saying to me during this time. That is going to be priceless, and I look forward to the spiritual growth and maturity that I will experience during this time. I’m thanking God in advance for using me to help other people (like me) in the hospital, who need encouragement, need to experience the love of Jesus Christ, and the faithfulness and joy that God brings into your life. I feel fortunate to be used by God to be a blessing to others while I’m here at the hospital. I pray that His light will shine in and through me, to help uplift and encourage the other patients here, as well as my doctors, nurses, and other hospital staff. By the way, with this beautiful, happy, smiling face in my life, every day is a great day!! If you’d like details on what hospital I’m staying at, to come by for a visit, or send me something, you can e-mail me at ashani@ashanimfuko.com. My New Mommy YouTube Channel Is Here! 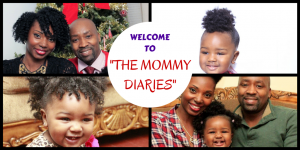 #TheMommyDiaries Has Officially Launched! The New Mommy Diaries YouTube Channel Is Here! Be Sure To Subscribe! This week I did something that I’ve been wanting to do for OVER A YEAR!! I started my new mommy channel on YouTube!! Woo Hoo! This is something that I’ve been wanting to do ever since my daughter was born. I actually thought that I’d be able to start it last year. 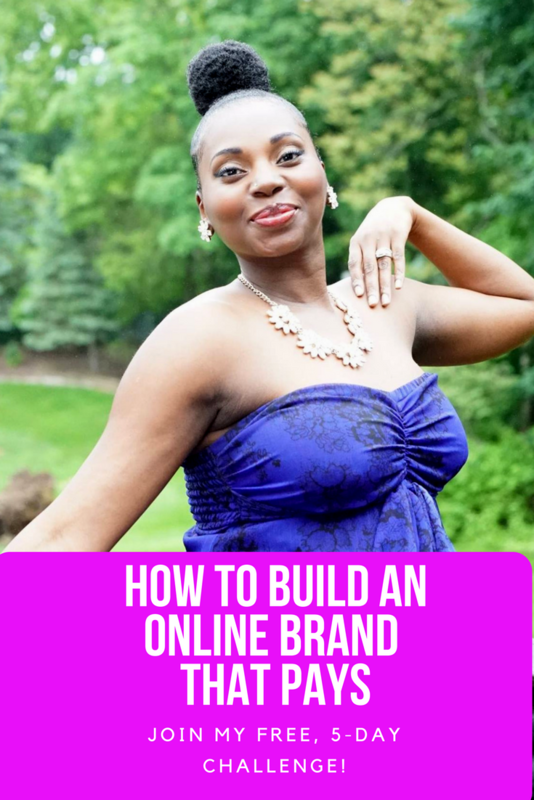 But between learning how to take care of a newborn, adjusting to motherhood, working from home, creating and managing social media strategies for clients, teaching dance classes, blogging, growing my brand, etc., I had a LOT going on! But, I hit the ground running in 2015, and I have officially launched my new mommy channel, “The Mommy Diaries”! Subscribe to my new mommy YouTube channel for how-to videos, tips and advice for new moms, natural hair tutorials, health and wellness tips, & inspiration! Check out my welcome video below, and be sure to subscribe to my channel HERE! You can watch my very first video for my channel, “How I Style My Daughter’s Natural Hair : Curly Frohawk Tutorial” HERE! If you’re a mom, or know of a mom that might be interested in my new channel, please like and share this post with them, and spread the word! I recently shared my 13-month old daughter’s new comp card on my Facebook page, as well as a private group I’m in for women and men with natural hair (no chemical relaxer). 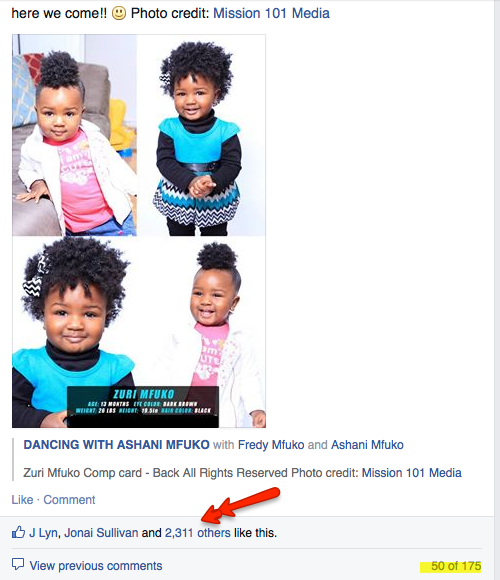 As you can see in the image below, with over 2,300 likes, and 175 comments (and counting) so many people loved her hair! 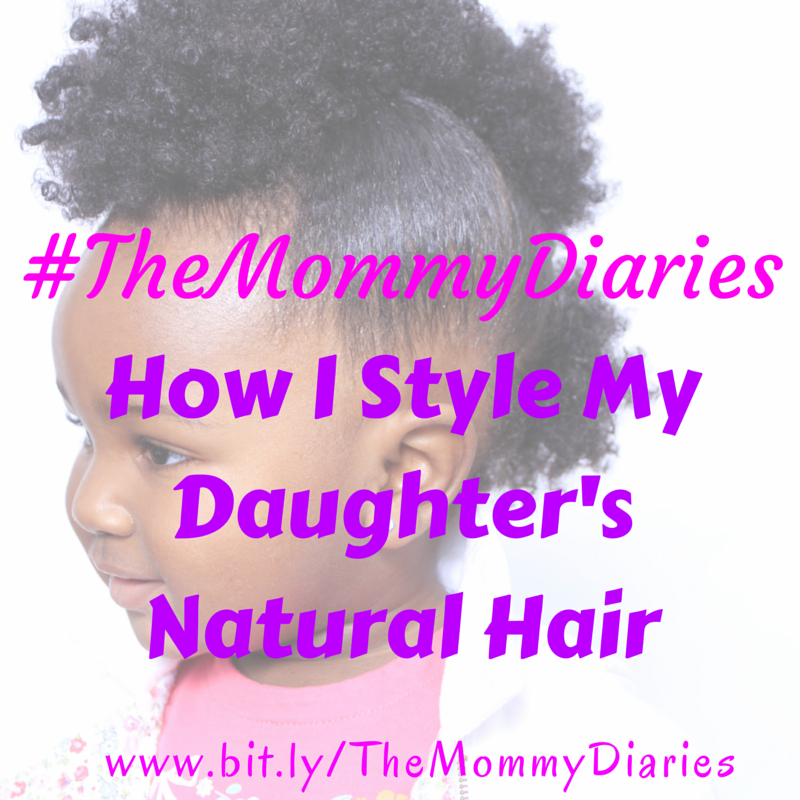 I received numerous requests to share how I style her hair, and what products I use in it as well. So I decided to create a video showing how I achieved her curly, ponytail frohawk. Check out the video, and be sure to subscribe to my new mommy channel on YouTube, #TheMommyDiaries, for more tutorials, and videos related to everything mommy life! 3) Shea Moisture’s Curl Enhancing Smoothie, or Shea Moisture’s Deep Treatment Masque, as a daily Moisturizer. 5) Curls’ Passion Fruit Curl Control Paste (to smooth her edges) <– This is my absolute FAVORITE hair product!! I did a review on it many years ago. You can watch that video below. 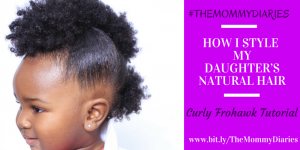 What are your favorite natural hair products for your daughter’s hair? Share them with me below. Have a question? Post it in the comments. I’m happy to help! Subscribe to #TheMommyDiaries channel on YouTube HERE!